Has the iPhone 5 been spotted in the wild? Can Apple keep nothing secret any more? Given we're likely around a month away from the iPhone 5 being announced, the rumours are really starting to fly - but this could be a big one. A mystery Apple device has been spotted in the wild, and looks every bit like it could be the iPhone 5. 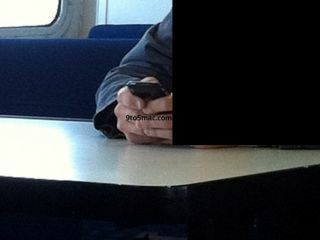 A chap on a train in San Francisco (well, we think it's a train judging by the photo - but let's be honest, that's not the bit we're assessing here) was spotted playing on an Apple phone, with covert photos taken and sent in to 9to5 Mac. According to the nosey tipster, he got a good look at the device the guy was using, and said he wasn't able to see a front/home button. The screen was a lot larger, although the chassis remained the same size, corroborating theories Apple will be making an edge-to-edge display - plus the device was thinner than the iPhone 4. The phone was curved, again as rumoured, and the edges were rounded metal 'like a Samsung Galaxy Tab 10.1' - which all seems to fit with the design specifications for the iPhone 5 being bandied about at the moment. We're not sure if this makes it more real or not, but the user was apparently trying very hard to cover the apple logo on the back of the phone - let's hope, for Jobs' sake, that didn't make the signal drop. So, complete bunkum or another iPhone spotted in the wild before launch? Either way, we're not far away from the announcement, so you can expect plenty more rumour, myth and speculation throughout August.